Here are some technical info. Q. I'm not Instagram user. Can I use InstaHeader? 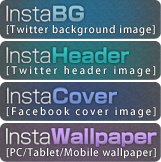 Even if you don't have Instagram ID, you can use InstaHeader to create an image by using photos in Instagram. Q. I tried to create a header image with my InstagramID, but preview image was not displayed. Please set privacy to "OFF." Enter your InstagramID with halfwidth alphabet or digit character. Otherwise, there are possibilies that Instagram API is not respoinding for your ID. Please try again in a couple of hours' time. Q. Does InstaHeader update my header with new Instagram photos automatically? You have to create another header with new photos, and set it to your header by yourself.